Good for the Mind, Body and Soul? I think so! And don’t we all need a little encouragement? A reminder that in the midst of the storms, there is that light at the end of the tunnel! And isn’t it amazing that just when you need that encouragement, something or someone comes your way and lifts you up by saying just the right thing? Just the right words that will motivate you to hold on and move forward? I love posters of encouragement and I look for them everyday to use in reaching out to those in need. I guess you can say that I collect them. I keep them in a special folder on my computer and should the time come when I cross paths with another person who is walking a difficult road, I pull from those posters the words that hopefully will reach into their mind, their body and into their soul and soothe, if just for a time, the pain that they may be going through. At Care4You, we work with clients everyday who are walking a road that sometimes is filled with many different kinds of issues. Illness, loneliness, heartbreak, concerns for family and friends, feeling the realization that they are not as young as they used to be and can not do things like they once could do, face them often. And then there are times when our clients are having such wonderful moments during their day that we become drawn into their beautiful world and are blessed more times than one can imagine!! And what is happening then? They are encouraging us! They lift our spirits with their ‘can do’ spirit! They wake up in the morning and they soar through the day, living each moment with a ‘smile on their attitude’. It’s contagious and I find myself filled with joy as I laugh at their little quips, their little remarks, their conversations…stories of days gone by as these marvelous Golden Agers reach out to share their lives with us!! They teach us that life isn’t over when you reach a certain age or are facing retirement. They are moving and they are serving all of us who just happen to be in their path and they sometimes don’t even know it! They are walking-talking posters, live and in person!! And while we at Care4You are walking side by side with our clients, giving them our best care, encouraging them with all the dedication we can give…..we too are being given encouragement as we watch in amazement our elderly living their lives by giving it everything they can!! I’m motivated! How about you? Patience…what is it and how does it affect us as we walk this road we are all on and how does it affect those around us to whom we so graciously give of it? I think this story is just one of many examples but a memorable one to say the least and maybe, just maybe we can all remember this the next time we don’t think that we have the ‘time’ to wait. Goodness, I know that I will as it reminds me of Care4You, a company who strives to practice this very important ‘walk’ in such a fast paced world. “A NYC Taxi driver wrote: I arrived at the address and honked the horn. After waiting a few minutes I honked again. Since this was going to be my last ride of my shift I thought about just driving away, but instead I put the car in park and walked up to the door and knocked..
‘Just a minute’, answered a frail, elderly voice. I could hear something being dragged across the floor. After a long pause, the door opened. A small woman in her 90’s stood before me. She was wearing a print dress and a pillbox hat with a veil pinned on it, like somebody out of a 1940’s movie. By her side was a small nylon suitcase. I quietly reached over and shut off the meter. ‘What route would you like me to take?’ I asked. For the next two hours, we drove through the city. She showed me the building where she had once worked as an elevator operator. We drove through the neighborhood where she and her husband had lived when they were newlyweds. She had me pull up in front of a furniture warehouse that had once been a ballroom where she had gone dancing as a girl. Sometimes she’d ask me to slow down in front of a particular building or corner and would sit staring into the darkness, saying nothing. I opened the trunk and took the small suitcase to the door. The woman was already seated in a wheelchair. ‘How much do I owe you?’ She asked, reaching into her purse. ‘Nothing,’ I said ‘You have to make a living,’ she answered. ‘There are other passengers,’ I responded. Almost without thinking, I bent and gave her a hug.She held onto me tightly. ‘You gave an old woman a little moment of joy,’ she said. ‘Thank you.’ I squeezed her hand, and then walked into the dim morning light. Behind me, a door shut. It was the sound of the closing of a life. I didn’t pick up any more passengers that shift. I drove aimlessly lost in thought. For the rest of that day, I could hardly talk.What if that woman had gotten an angry driver, or one who was impatient to end his shift? What if I had refused to take the run, or had honked once, then driven away? A website out of the U.K. has recently posted the now well-traveled story of my experience as a cab driver, when I picked up an old woman who was on her way to a hospice. It has reached number one on a number of websites as a result. I am thrilled when my ordinary life offers up an extraordinary moment that brings some solace or insight or enjoyment to others, and such has been the good fortune of that moment in the late 1980’s when I was driving the “dog shift” in Minneapolis, Minnesota. What is noteworthy about that moment, beyond it’s poignancy, is that I did not create it; I merely experienced it and let it unfold. Life gives us all such moments — I call them “Blue Moments” — where a brilliant light shines through the ordinary moments in our ordinary days. They come unsolicited and unannounced, and provide us the gift of significance and, if we are lucky, the opportunity to serve. Thank you Kent Nerburn, for what you did for this dear elderly woman and thank you Donna Hoover for being such a wonderful example of showing what it means to be patient, not only to those of us who walk alongside of you at Care4You, but also to our clients who need and want us to help them in their homes and to all of those who support our endeavors to serve our beautiful seniors and our community! Music…I think it touches the soul, from the very young to the very old! There is a lot to be said for how music moves people in many different ways. Music therapists seem to be doing just that. Bringing music into the lives of men, women and children alike and the results are amazing! I know from my own experience as a caregiver for my Mom and Dad, how important music was in their lives and what it did to help them in their later years. Walking beside her during this time, I moved around in front of her and drew her close as if I was giving her a hug. My intent was to try and help her move towards me. While softly trying to reassure her, I had a thought. Sing, Deb, sing! So I started to sing, ‘Tea for Two’ and all of the sudden Mom started to sway to the music. As I continued to sing, she stepped forward towards me and I went right along with her, letting her lead. She was moving with the music! Was she finding the connection with her legs through the song? I kept singing and she kept smiling and ‘dancing’ and slowly but surely we were making progress towards her chair. When she sat down, she looked up at me with the biggest smile on her face. I was just as amazed as she was! I knew how music had touched my soul since I was a little girl and here I was, experiencing something so special that would lead me to pass on the ‘lesson’ to others! And not only did this seem to heighten her joy at the moment but it appeared to sustain Mom for the rest of the day. It was a joy to behold in seeing how music had touched her in this way! The mind, the body and the spirit! My Dad in his final days at home on Hospice, asked me on many occasions to play several of his favorite CDs! He loved music and while he didn’t have dementia, I could see his response and how this beautiful ‘gift’ of song touched him deeply, giving him such a sense of peace. While watching this video below, I see how the residents in this nursing home were responding to simple IPods that were loaded with their favorite songs. How wonderful! I’ve attended concerts with seniors and have seen first hand what just an hour or two of music does for them! 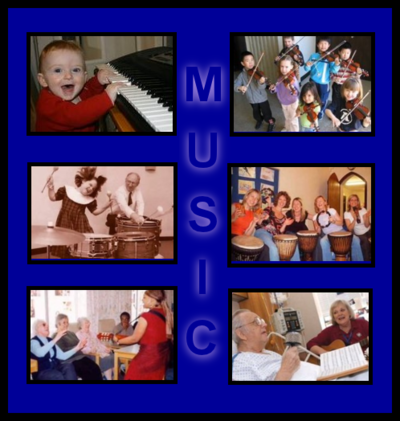 Working for Care4You has allowed me to understand our clients in their love for music. It’s as individual as they are. Some love the good old Gospel songs, the beautiful hymns that have been alive for years with wonderful stories behind each and every one of them. Then there are some who enjoy the richness of the songs of the 40s. One of my favorite times, by the way! I used to say that I was born in the wrong era. That I should have come into this world 30 years earlier! But then I realized that my love for the songs of yesteryear, serves not only to keep this music alive for generations to come but it helps me in my work with my clients. As long as we are on this earth, I think that music will play a really big part in our lives, way into our golden years! I’ve seen the response from our wonderful seniors when music is introduced into their day. I once had a client who used to walk with me around the neighborhood. We would start singing as soon as we reached the sidewalk. I don’t know who was happier, although I think we both were equally! As we would walk and sing, occasionally I would do a little ‘2-step’ which would make both of us bust out laughing. Yes…music touches us all in one way or another. From the very young to the precious old, we carry it forward to bless the minds, the bodies and the spirits of those who have walked before us and are still here and those who will follow.